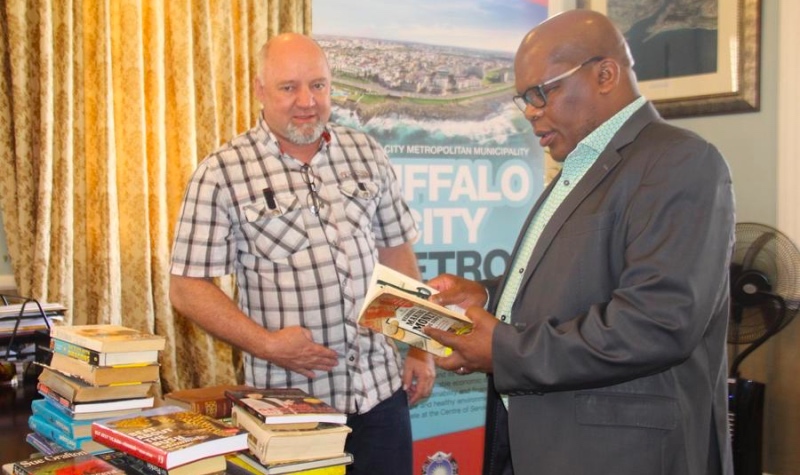 With this week, being National Book Week, the Mayoral Library Legacy Project led by Executive Mayor Councillor Xola Pakati received this morning 700 books from Sondlo&Knopp Agency as part of reducing illiteracy in the City. This morning, Pakati hosted the agency at the East London City Hall at 9am. Speaking at the handover ceremony he said that the City is grateful to all donations and these books will help young children in the City. “During my visits to various City libraries, I have identified that material contained in Township Libraries is limited and no relevance in the current curriculum and these donations will assist children in school projects and other school needs,” said Pakati. These books will be shared by the EL Library and Mdantsane Library and the next donation will go to KWT and other areas. The book donation is set to create an environment of learning amongst children in Buffalo City Townships. The donation comes after a plea by the Executive Mayor that business communities and individuals help contribute books to help reduce illiteracy in the City.